Ashif Mawji is a serial social entrepreneur and investor who has built & sold several enterprises and is heavily engaged in the community. He presently serves as a Venture Partner at Rising Tide (a San Francisco Bay Area Venture Capital firm). 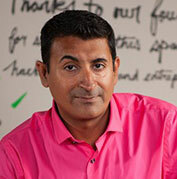 Although he had humble roots, Ashif is now a nationally renowned business owner and winner of numerous awards, Ashif was awarded the 2002 Ernst & Young Prairies Entrepreneur of the Year award and in 2005 was named as one of Canada’s Top 40 under 40 and in 2007 named BDC’s Entrepreneur of the Year (Alberta) and has received Canada’s 50 Best Managed companies award three years in a row. He received NAIT’s Alumni of Distinction Award and was also recognized as one of the Top 50 Graduates in 50 years. In 2017, Ashif was named an Honorary Col for the 20th Field Artillery Regiment (Canadian Army) in addition to receiving the Queen’s Golden and Diamond Jubilee medals as well as the Alberta Centennial Medal. In 2017, The Northern Alberta Institute of Technology bestowed him with an Honorary Bachelor of Business Administration. Some boards he has served or currently serves with are: Edmonton Police Foundation (Chair), Sarah McLachlan School of Music, Young Presidents Organization Alberta (Chair), Stollery Children’s Hospital Foundation, Edmonton Oilers Community Foundation, Kids Kottage, Alberta’s Promise, Economic Development Edmonton, Northern Alberta Institute of Technology, Corent Technology, University Hospital Foundation, Citadel, Edmonton Opera and others. Not surprisingly, Ashif has also been a Prairies and National judge for the EY Entrepreneur of the Year program. Named a Henry Crown Fellow in the class of 2015 (only one of three Canadians ever to be selected to this group, since 1996), Ashif is proud to be associated with the Henry Crown Fellowship as a part of the globally renowned Aspen Institute. Ashif is happily married and has two boys. Ashif Mawji has built his business empire on generosity and kindness. He bases his decisions on values and continuously asks himself “Just because I can do this…should I?” In this episode you will find out how Ashif’s rise from poverty to serial entrepreneurial wealth was developed, and the servant leadership style he formed as a result. Born in Mombasa, Kenya, with humble beginnings, Ashif learned from his parents that giving was not only important but necessary. Even though they didn’t have much, every Friday his family would hand out Kenyan shillings to homeless people at the Mosque. Seeing the smiles and gratitude of people they helped, was something that really marked him and set him on a course of generosity for the rest of his life. Caring for others, looking after your neighbours and sharing were some of the religious and family values Ashif was brought up with that formed who he is today as a leader. Ashif grew up in a family with a strong sense of entrepreneurship. His parents told him “You can have anything you want, you just have to find a way to pay for it!” This taught him early on to find ways to make money. For example, when his family went to England, he bought three keyboards; one for himself and two to sell, which allowed him to get his own keyboard for free. He did the same thing with computers and other items and learned to make strategic money decisions from the age of nine onwards. The Henry Crown Fellowship is about helping business leaders and entrepreneurs understand about business integrity by asking the question, “Just because you can, should you?” and focusing on values and being true to your word. For example if you are a pharmaceutical company and can triple the price of an epi pen because people need it to save their lives in an emergency situation, should you? This one question has really focused Ashif in his daily business practice. He has espoused the values of the Henry Crown program as part of his leadership style and adopted them into his own sense of culture. Ashif used to race motorcycles as a team and learned to “take one for the team” to help the other team members build their capacity. In business, he translates this to “leading from behind”. Others get the limelight because you built them to the point where they could succeed. In hockey, a player who shows leading from behind is Connor McDavid. Wayne Gretsky was the same. Ashif’s leadership style is built on the belief that leading from behind and building a team are more important than focusing on your own glory. Ashif has a “Type A” personality. It helps him to take action and make decisions, but it means he doesn’t always take time to think things through and makes more mistakes as a result. This risk taking tendency is something he continues to struggle with. For personality, although others might describe him as kind and generous, he doesn’t always see himself as kind because of his tendency to feel impatient. He continuously has to fight the impulse to say, “I know the answer, let me say it!” But he knows that doing so helped him develop others’ capacity. It is natural for Ashif to step in and help in a situation where others would think twice. One time there was a homeless person who fell in the street, and without thinking, Ashif picked him up and helped him stabilize. He then realized that everyone else was just standing around wondering if they should do something. That was a time he thought what was normal for him was not normal for others.